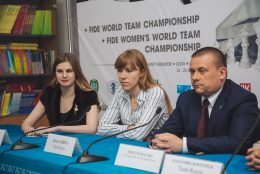 Press-conference with the winners of the FIDE Women’s World Team Championship – team Russia and its head coach Sergei Rublevsky. — Congratulations with a brilliant performance! Tell us which matches were the most important for your victory? — Our main and traditional opponent on such tournaments is team China. 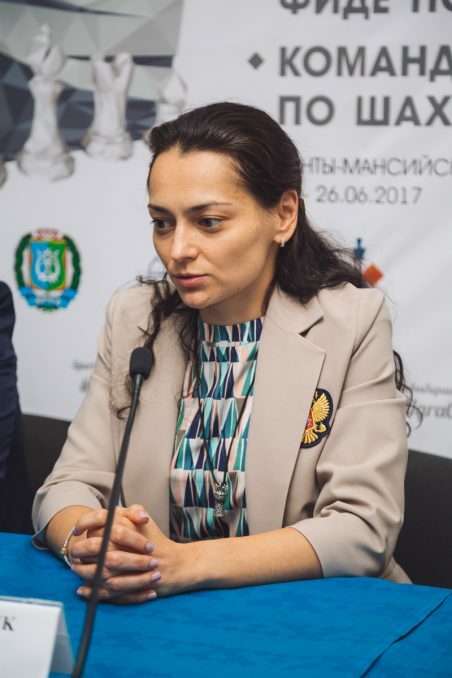 Russia and China dominate in women’s chess for a long time. The match between us was played in round 1. We were lucky it was in the beginning of the championships, probably our opponent was still having some jetlag, so we won with quite a solid result. Of course, this meant a lot for the final result of the tournament. It was clear for us that the team that will win that match would have greater chances to win the whole event. 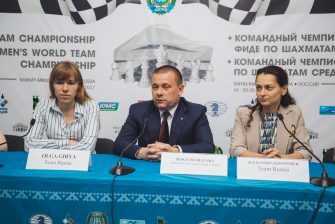 Later on we won the key matches against Georgia and Ukraine. Maybe we were a bit lucky in the match against Georgia, but we could have performed better playing against Azerbaijan and USA. I’d prefer not to distinguish some players, because we had our team goal and we were all heading for one and the same result. Even today all the team members were so determined to win and supported each other. — In your opinion what games on this tournament could be called your best ones? — It is very difficult to talk about personal games as our main goal was to win as a team. I will be analyzing my games a bit later, now I just want to celebrate the gold medal of my team. But still the most remarkable game for me was played against Georgia. My opponent had a fortress and then she somehow destroyed it herself. However, this was not only my victory but a mistake made by my opponent. — I think my teammate is a bit shy. Her performance at board 1 was totally great and she managed to keep calm all the time. At least it seemed so when I was watching her games. And talking about me, I would say that my first game against China was very important for me. I was playing quite well, but, unfortunately, I lost. Maybe this is the biggest regret of this tournament for me. But in general, I am very satisfied with my performance. — How do you train before such tournaments? 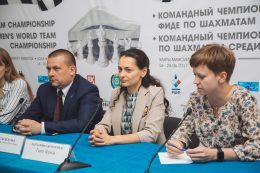 — We are having training camps not just before such important events. 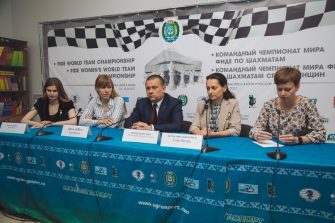 We are doing our best to have them along the year as well, still our women’s team has such a tight calendar so before this tournament our training was very short – just three or four days. 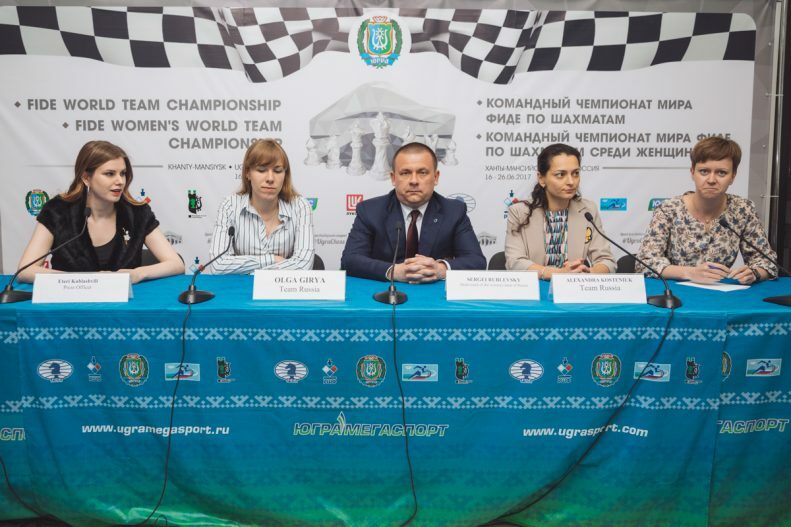 Olga has arrived from the European Individual Championship, where her performance was really great, she got +2 but maybe she got a bit tired. Still she practiced a lot. 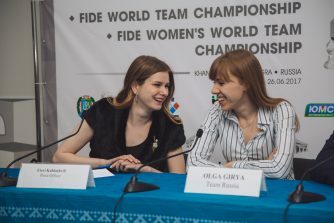 Alexandra Goryachkina was playing there as well. In general, training camps are very important. We have arrived to this championships a bit earlier than others, we wanted to get used to the time difference. Chinese team did not have such an opportunity so, probably, it played a key role in this competition. — Does you team want to win the whole circle of team events 2017-2018? 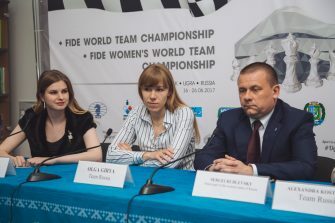 — It is worth noting that women’s team of Russia has never won the World Team Championships. This is strange, because we were winning both Olympiads and European Championships several times, but not the World Team Championships. 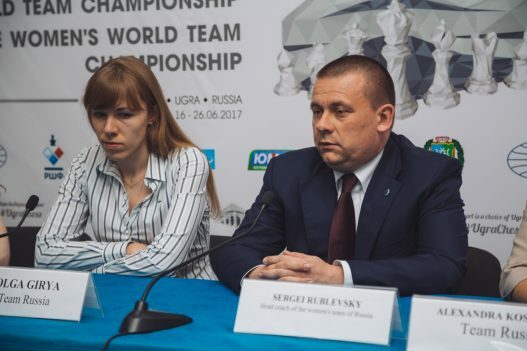 Of course, it is very important to win European events, but world tournaments are even more important. Besides, we have also won a friendly match against China a year ago, this was a very important victory for us. We will do our best, our team’s line-up is very strong so there are no goals we can’t achieve.